Business owners – stick with WordPress. If my real world product experience has taught me one thing, it’s to never put all of your eggs into one basket. Another hard learned experience that is proven daily with each new gizmo upgrade, software update or “feature” release—expect it to have bugs. You’ve probably experienced this yourself with each new app update on just your phone. Bugs just seem to be on a proverbial apocalyptic rise these days. This thing alone makes the “avoid putting all of your eggs into one basket” mantra even more important. Smart business owners diversify their eggs which is why you never build a website using a walled garden one spot shop. Real businesses require complete ownership AND control over things such as domain ownership and its renewal process, web hosting resources, DNS management, design and SEO tools. Where Squarespace removes the complexity of those details with a forever-monthly-payment plan, it sacrifices versatility and even security by becoming a single point of failure for your business website—and revenue stream—when something breaks. Something will always break. No matter where your website lives, a business has to operate under this assumption. The question that matters is: Is it easier to recover with a WordPress site or a Squarespace site? With Squarespace, you contact them and hope for the best. A WordPress.org based website though rests on a diversified and open-source philosophy where options remove the annoying squeaks and grinds often found with “we’ve simplified and taken the complexity away” Squarespace approach. You see, taking the complexity away in the case of website building is a recipe for a painful recovery process when something goes wrong. With a WordPress website, you are in the driver’s seat with complete control over the details that will matter when a problem occurs. If you don’t get the performance you require from your web host, you can move. If your site is under attack or you want to increase your security level, you have complete access and control over your DNS settings (or better, placed that management outside of your web host). You get this in a WordPress site—not a Squarespace site. Also, having complete access and control over the code is going to make the world of a difference when you need to customize the look of your site. Notice the warnings and discouragement against tweaking that code on Squarespace: Using Squarespace CSS Editor. Also, notice the limits on making CSS changes with Squarespace. CSS is the language that every serious business website needs access to for customizing the look of your site. WordPress thrives, supports and wins because of its CSS, HTML and PHP support. CSS access and customization is built into every WordPress dashboard. I’ve fixed so many issues for clients who brought their WordPress site to me with simple CSS changes that would not have been possible with Squarespace, that I look at Squarespace as a problem waiting to happen. WordPress saves you time and development costs. Squarespace would have added to both. Too many businesses learn and pay dearly for not having the website flexibility and support that WordPress incorporates. If SEO is important to your business, then WordPress is your choice as well. The options and control over SEO possibilities within WordPress make this the obvious winning pick. Squarespace offers a very simplistic overview and approach to SEO. WordPress sites breath and eat SEO from the smallest details to the large community support on this topic. There is a valid reason why nearly a quarter of all websites today are built with WordPress. For me, it boils down to the level of control I have over the details. 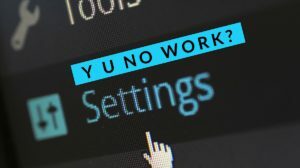 Where some argue that by removing those details a business can get a functioning website up and running easily (albeit for a forever monthly/yearly plan), I argue that it’s a recipe for future disaster and costly mistakes. If Squarespace was the better choice, I’d have no problem recommending it for a business. For a real business with real business goals, WordPress is just the better choice though. I’m a product guy at heart, and I get paid to look at the big picture. My personal experience and opinion finds WordPress to be in a completely different professional league over Squarespace. Your miles may vary, but my miles come from having pedaled through them in all weather. If you are a WordPress site owner that moved to Squarespace, I’d love to know why and how it’s working. I’m more accustomed to seeing the reverse migration—from a drag-and-drop-one-stop-shop to a WordPress deployment. WordPress just makes sense to me on every business decision level.